Step 1: System Administrator licenses - End users are free. We'll need to know how many System Administrator credits you think you will need across the modules. Step 2: Choose your support package - We'll send you information about our bronze, silver, gold and platinum support options. 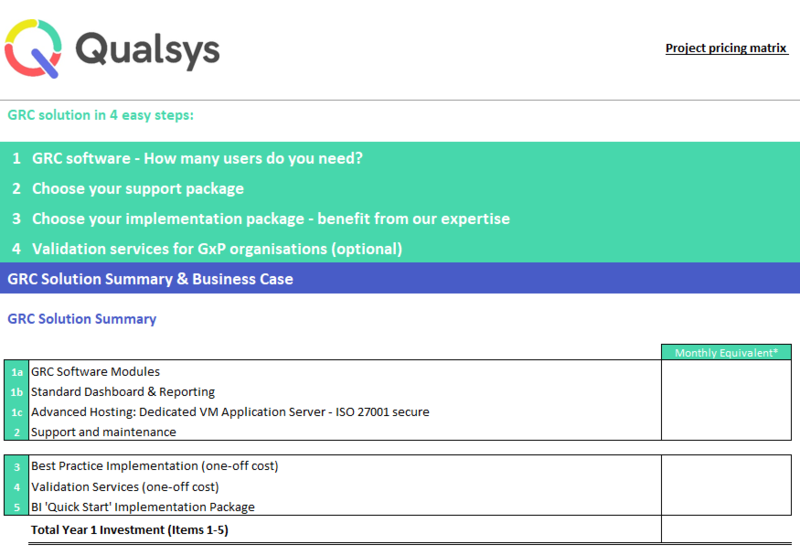 Step 3: Implementation package - Tell us if you need any ERP / API integrations, custom development, additional training, custom templates, or validation support. Many vendors will underestimate the energy, time, commitment and resources required to properly implement a new governance, risk and compliance management solution in order to win your business. This results in unrealistic expectations, costs which haven't been budgeted, and an unsuccessful, frustrating partnership for both parties. Our pricing is based on 22+ years experience implementing over 400 systems. The pricing is agreed with our Service Implementation Managers, Development team, and existing customers as being reasonable in order to get the results our customers want.